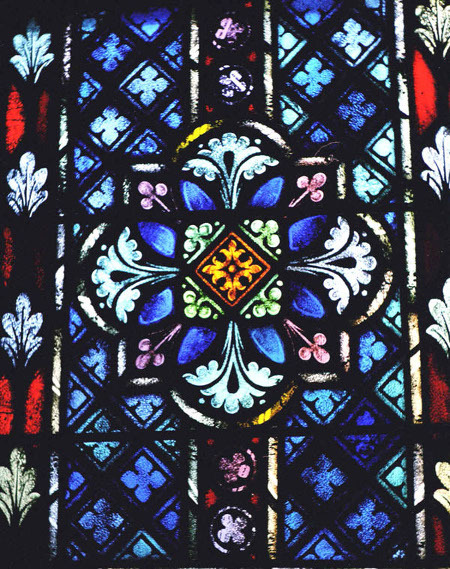 Once upon a time, thousands of years ago, stained glass was used only in grand Cathedral windows to bring in sunlight and illuminate the “hearts of men”. Many years later, wealthy aristocrats added the elegance of stained glass windows to their mansions and palaces. These days just about anyone can decorate their home with the beauty and elegance of stained glass. Back in the 18th century, stained glass artists like Tiffany and La Farge changed the face of stained glass and proved that the medium could be used for more than just windows. Light fixtures, lamps, picture frames and mirrors lined with stained glass are all beautiful additions to almost any home or business. Where should you add stained glass? The entryway to the home is a good place to begin as this is where your guest’s first impression is made and it is also the first sight welcoming you home each day. Stained glass will add color and style to an otherwise boring door and window pane in your entryway. The stained glass will allow light in while adding very desirable privacy to your home. Modern stained glass comes in a variety of styles and colors and can easily be matched to any dÈcor whether modern or classic. Living rooms can benefit from unique and beautiful Tiffany-style lamps. Choose a color and style that compliments your upholstery, carpet and wall colors or go for a highly contrasting eclectic look. The stained glass lamp can simply blend in and be a useful source of light for reading or it can be the added bit of character that serves as a “conversation piece” in the home. Either way “a thing of beauty is a joy to behold” so add some joy to your living space! The dining room is a great place for a stained glass chandelier. Beveled edges and translucent colors will add interest and excitement to your table setting. Lighting certainly sets the mood for the dining room and stained glass provides just the right feel. Food even seems to taste better when served in beautiful surroundings, don’t you agree? The bathroom can be accentuated with a beautifully stained glass framed mirror and/or Tiffany-style light fixtures. How about a jewel-look stained glass soap holder? Use one of the main colors in the stained glass to match your towels, toothbrush holder, shower curtain and soap dispenser to for a fabulous, elegant rich look. These items don’t need to be expensive and your bathroom will look like it belongs to the Vanderbilt’s! A beautiful stained glass window over the kitchen sink would certainly make doing dishes more enjoyable. Casual meals in the breakfast nook would seem more extraordinary when surrounded by beautiful stained glass. Dishes in one of the jewel-tones of the stained glass and a contrasting jewel-toned tablecloth would pull the look together nicely. Saving the best for last…the bedroom! Beautiful stained glass lamps gracing the nightstands on either side of the bed could help to set the mood. A stained glass vase or jewelry box on top of the dresser could be just the touch you need. There are so many ways to decorate with stained glass. You could easily put a stained glass piece in every room of the house either to compliment your decorating theme or even AS your decorating theme. Let your imagination run wild and enjoy your newfound love of stained glass.